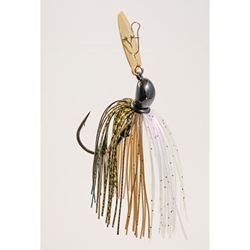 The Original Nasty’s Thumper, a patent-compliant bladed swim jig featuring the best available components: an incredibly sharp and strong Gamakatsu® hook, a hand-tied skirt around a silicone core, and a reliable snap. Local anglers quickly figured out that the Nasty’s Thumper, unlike other patent-compliant bladed jigs, has a unique hunting action that triggers reaction strikes in shallow water. Instead of constantly locking up and creating frustration for anglers, the Nasty’s Thumper will dart around erratically like injured prey. The Nasty’s Thumper will run similar to other bladed jigs on a standard retrieve.